Are Your Deleted Files Really Gone? Remove Files Securely in Seconds! Emptying the Recycle Bin and even quick-formatting your hard drive doesn't mean that your files are gone for good. Anyone with file recovery software can undelete them in just a couple of minutes and access your sensitive data. This is why it's especially dangerous to sell or give away your computer without securely removing all sensitive files from it. Easy File Shredder will help shred files beyond recovery, wipe free disk space clean, and keep your private information safe and secure. * Clicking on the free download button will initiate the EasyFileShredder installation process. How Does Easy File Shredder Work? 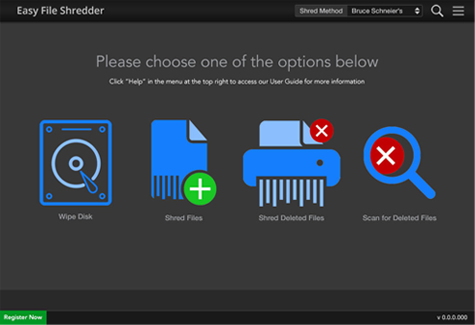 Easy File Shredder shreds files beyond recovery. It uses advanced data deletion algorithms approved by the military and government organizations. Easy File Shredder can shred hard drive free space to remove traces of all deleted files. Shredding free disk space will protect your privacy and keep your details safe. Easy File Shredder is very easy to use. Shredding files or free space is an easy three-step process. All you need to do is launch the program and follow the prompts. Why Use Easy File Shredder? Easy File Shredder is designed for fast and secure file removal. It's a secure file shredder that erases files with a special set of binary data multiple times. In other words, Easy File Shredder overwrites files several times with a set of different characters and numbers. This process is called data shredding and it ensures that no file recovery software can undelete any bits and pieces of the original deleted file. Easy File Shredder uses the highest standard data removal algorithms that guarantee complete file removal. It leaves no traces whatsoever, which means that even the most advanced file recovery software won't be able to undelete the shredded files. It's up to you which shredding method to use. You can choose from more than ten different data deletion methods that provide different levels of security, or you can create your own unique algorithm to shred your files. In addition to securely deleting files, Easy File Shredder can be used as a disk wiper utility to overwrite all free space on your hard drive with random data. Disk wiping is especially useful when you are selling or giving away your computer and need to make sure no sensitive data can be recovered from the drive. Just like the file removal module, the disk wiper supports over ten data deletion algorithms to overwrite free space in multiple passes. You can be sure that no files can be recovered from your PC once Easy File Shredder has finished its job!